It has been suggested that this article be merged into Carbon neutrality. (Discuss) Proposed since April 2019. The 550 MW Desert Sunlight Solar Farm in California. 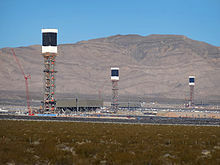 The 392 MW Ivanpah Solar Power Facility in California: The facility's three towers. Construction of the Salt Tanks which provide efficient thermal energy storage  so that output can be provided after the sun goes down, and output can be scheduled to meet demand requirements. The 280 MW Solana Generating Station is designed to provide six hours of energy storage. This allows the plant to generate about 38 percent of its rated capacity over the course of a year. The endeavor to use 100% renewable energy for electricity, heating/cooling and transport is motivated by global warming, pollution and other environmental issues, as well as economic and energy security concerns. Shifting the total global primary energy supply to renewable sources requires a transition of the energy system. In 2013 the Intergovernmental Panel on Climate Change said that there are few fundamental technological limits to integrating a portfolio of renewable energy technologies to meet most of total global energy demand. Renewable energy use has grown much faster than even advocates anticipated. In 2014, renewable sources such as wind, geothermal, solar, biomass, and burnt waste provided 19% of the total energy consumed worldwide, with roughly half of that coming from traditional use of biomass. The most important sector is electricity with a renewable share of 22.8%, most of it coming from hydropower with a share of 16.6%, followed by wind with 3.1%. According to the REN21 2017 global status report, these figures had increased to 19.3% for energy in 2015 and 24.5% for electricity in 2016. There are many places around the world with grids that are run almost exclusively on renewable energy. At the national level, at least 30 nations already have renewable energy contributing more than 20% of the energy supply. According to a review of the 181 peer-reviewed papers on 100% renewable energy which were published until 2018, "[t]he great majority of all publications highlights the technical feasibility and economic viability of 100% RE systems." While there are still many publications which focus on electricity only, there is a growing number of papers that cover different energy sectors and sector-coupled, integrated energy systems. This cross-sectoral, holistic approach is seen as a important feature of 100% renewable energy systems and is based on the assumption "that the best solutions can be found only if one focuses on the synergies between the sectors" of the energy system such as electricity, heat, transport or industry. Professors S. Pacala and Robert H. Socolow of Princeton University have developed a series of "climate stabilization wedges" that can allow us to maintain our quality of life while avoiding catastrophic climate change, and "renewable energy sources," in aggregate, constitute the largest number of their "wedges." Mark Z. Jacobson, professor of civil and environmental engineering at Stanford University and director of its Atmosphere and Energy program, says that producing all new energy with wind power, solar power, and hydropower by 2030 is feasible, and that existing energy supply arrangements could be replaced by 2050. Barriers to implementing the renewable energy plan are seen to be "primarily social and political, not technological or economic". Jacobson says that energy costs today with a wind, solar, and water system should be similar to today's energy costs from other optimally cost-effective strategies. The main obstacle against this scenario is the lack of political will. His conclusions have been disputed by other researchers. Jacobson published a response that disputed the piece point by point and claimed that the authors were motivated by allegiance to energy technologies that the 2015 paper excluded. Similarly, in the United States, the independent National Research Council has noted that "sufficient domestic renewable resources exist to allow renewable electricity to play a significant role in future electricity generation and thus help confront issues related to climate change, energy security, and the escalation of energy costs ... Renewable energy is an attractive option because renewable resources available in the United States, taken collectively, can supply significantly greater amounts of electricity than the total current or projected domestic demand." The main barriers to the widespread implementation of large-scale renewable energy and low-carbon energy strategies are political rather than technological. According to the 2013 Post Carbon Pathways report, which reviewed many international studies, the key roadblocks are: climate change denial, the fossil fuels lobby, political inaction, unsustainable energy consumption, outdated energy infrastructure, and financial constraints. Using 100% renewable energy was first suggested in a paper in Science  published in 1975 by Danish physicist Bent Sørensen, which was followed by several other proposals. In 1976 energy policy analyst Amory Lovins coined the term "soft energy path" to describe an alternative future where energy efficiency and appropriate renewable energy sources steadily replace a centralized energy system based on fossil and nuclear fuels. In 1998 the first detailed analysis of scenarios with very high shares of renewables were published. These were followed by the first detailed 100% scenarios. In 2006 a PhD thesis was published by Czisch in which it was shown that in a 100% renewable scenario energy supply could match demand in every hour of the year in Europe and North Africa. In the same year Danish Energy professor Henrik Lund published a first paper in which he addresses the optimal combination of renewables, which was followed by several other papers on the transition to 100% renewable energy in Denmark. Since then Lund has been publishing several papers on 100% renewable energy. After 2009 publications began to rise steeply, covering 100% scenarios for countries in Europe, America, Australia and other parts of the world. Solar photovoltaic modules have dropped about 75 per cent in price. Current scientific and technological advances in the laboratory suggest that they will soon be so cheap that the principal cost of going solar on residential and commercial buildings will be installation. On-shore wind power is spreading over all continents and is economically competitive with fossil and nuclear power in several regions. Concentrated solar thermal power (CST) with thermal storage has moved from the demonstration stage of maturity to the limited commercial stage and still has the potential for further cost reductions of about 50 per cent. Renewable energy use has grown much faster than even advocates had anticipated. Wind turbines generate 39 percent of Danish electricity, and Denmark has many biogas digesters and waste-to-energy plants as well. Together, wind and biomass provide 44% of the electricity consumed by the country's six million inhabitants. In 2010, Portugal's 10 million people produced more than half their electricity from indigenous renewable energy resources. Spain's 40 million inhabitants meet one-third of their electrical needs from renewables. Renewable energy has a history of strong public support. In America, for example, a 2013 Gallup survey showed that two in three Americans want the U.S. to increase domestic energy production using solar power (76%), wind power (71%), and natural gas (65%). Far fewer want more petroleum production (46%) and more nuclear power (37%). Least favored is coal, with about one in three Americans favouring it. At the national level, at least 30 nations around the world already have renewable energy contributing more than 20% of energy supply. National renewable energy markets are projected to continue to grow strongly in the coming decade and beyond, and some 120 countries have various policy targets for longer-term shares of renewable energy, including a binding 20% by 2020 target for the European Union. Some countries have much higher long-term policy targets of up to 100% renewables. Outside Europe, a diverse group of 20 or more other countries target renewable energy shares in the 2020–2030 time frame that range from 10% to 50%. Nuclear power involves substantial accident risks (e.g., Fukushima nuclear disaster, Chernobyl disaster) and the unsolved problem of safe long-term high-level radioactive waste management, and carbon capture and storage has rather limited safe storage potentials. These constraints have also led to an interest in 100% renewable energy. A well established body of academic literature has been written over the past decade, evaluating scenarios for 100% renewable energy for various geographical areas. In recent years, more detailed analyses have emerged from government and industry sources. The incentive to use 100% renewable energy is created by global warming and ecological as well as economic concerns, post peak oil. The first country to propose 100% renewable energy was Iceland, in 1998. Proposals have been made for Japan in 2003, and for Australia in 2011. Albania, Iceland, and Paraguay obtain essentially all of their electricity from renewable sources (Albania and Paraguay 100% from hydroelectricity, Iceland 72% hydro and 28% geothermal). Norway obtains nearly all of its electricity from renewable sources (97 percent from hydropower). Iceland proposed using hydrogen for transportation and its fishing fleet. Australia proposed biofuel for those elements of transportation not easily converted to electricity. The road map for the United States, commitment by Denmark, and Vision 2050 for Europe set a 2050 timeline for converting to 100% renewable energy, later reduced to 2040 in 2011. Zero Carbon Britain 2030 proposes eliminating carbon emissions in Britain by 2030 by transitioning to renewable energy. In 2015, Hawaii enacted a law that the Renewable Portfolio Standard shall be 100 percent by 2045. This is often confused with renewable energy. If electricity produced on the grid is 65 GWh from fossil fuel and 35 GWh from renewable energy and rooftop off grid solar produces 80 GWh of renewable energy then the total renewable energy is 115 GWh and the total electricity on the grid is 100 GWh. Then the RPS is 115 percent. Cities like Paris and Strasbourg in France, planned to use 100% renewable energy by 2050. It is estimated that the world will spend an extra $8 trillion over the next 25 years to prolong the use of non-renewable resources, a cost that would be eliminated by transitioning instead to 100% renewable energy. Research that has been published in Energy Policy suggests that converting the entire world to 100% renewable energy by 2030 is both possible and affordable, but requires political support. It would require building many more wind turbines and solar power systems but wouldn't utilize bioenergy. Other changes involve use of electric cars and the development of enhanced transmission grids and storage. As part of the Paris Agreement, countries periodically update their climate change targets for the future, by 2018 no G20 country had committed to a 100% renewable target. Until 2018 there were 181 peer-reviewed papers on 100% renewable energy. In the same year, 100% renewable energy was also mentioned in the Special Report on Global Warming of 1.5 °C as a potential means to "expand the range of 1.5 °C pathways", if the findings can be corroborated. The Fourth Revolution: Energy is a German documentary film released in 2010. It shows the vision of a global society, which lives in a world where the energy is produced 100% with renewable energies, showing a complete reconstruction of the economy, to reach this goal. In 2011, Hermann Scheer wrote the book The Energy Imperative: 100 Percent Renewable Now, published by Routledge. Imagine fuel without fear. No climate change. No oil spills, dead coal miners, dirty air, devastated lands, lost wildlife. No energy poverty. No oil-fed wars, tyrannies, or terrorists. Nothing to run out. Nothing to cut off. Nothing to worry about. Just energy abundance, benign and affordable, for all, for ever. The Intergovernmental Panel on Climate Change has said that there are few fundamental technological limits to integrating a portfolio of renewable energy technologies to meet most of total global energy demand. In a 2011 review of 164 recent scenarios of future renewable energy growth, the report noted that the majority expected renewable sources to supply more than 17% of total energy by 2030, and 27% by 2050; the highest forecast projected 43% supplied by renewables by 2030 and 77% by 2050. The development of affordable, inexhaustible and clean solar energy technologies will have huge longer-term benefits. It will increase countries' energy security through reliance on an indigenous, inexhaustible and mostly import-independent resource, enhance sustainability, reduce pollution, lower the costs of mitigating climate change, and keep fossil fuel prices lower than otherwise. These advantages are global. Hence the additional costs of the incentives for early deployment should be considered learning investments; they must be wisely spent and need to be widely shared. In 2011, the refereed journal Energy Policy published two articles by Mark Z. Jacobson, a professor of engineering at Stanford University, and research scientist Mark A. Delucchi, about changing our energy supply mix and "Providing all global energy with wind, water, and solar power". The articles analyze the feasibility of providing worldwide energy for electric power, transportation, and heating/cooling from wind, water, and sunlight (WWS), which are safe clean options. In Part I, Jacobson and Delucchi discuss WWS energy system characteristics, aspects of energy demand, WWS resource availability, WWS devices needed, and material requirements. They estimate that 3,800,000 5 MW wind turbines, 5350 100 MW geothermal power plants, and 270 new 1300 MW hydroelectric power plants will be required. In terms of solar power, an additional 49,000 300 MW concentrating solar plants, 40,000 300 MW solar photovoltaic power plants, and 1.7 billion 3 kW rooftop photovoltaic systems will also be needed. Such an extensive WWS infrastructure could decrease world power demand by 30%. In Part II, Jacobson and Delucchi address variability of supply, system economics, and energy policy initiatives associated with a WWS system. The authors advocate producing all new energy with WWS by 2030 and replacing existing energy supply arrangements by 2050. Barriers to implementing the renewable energy plan are seen to be "primarily social and political, not technological or economic". Energy costs with a WWS system should be similar to today's energy costs. Because the wind blows during stormy conditions when the sun does not shine and the sun often shines on calm days with little wind, combining wind and solar can go a long way toward meeting demand, especially when geothermal provides a steady base and hydroelectric can be called on to fill in the gaps. A 2012 study by the University of Delaware for a 72 GW system considered 28 billion combinations of renewable energy and storage and found the most cost-effective, for the PJM Interconnection, would use 17 GW of solar, 68 GW of offshore wind, and 115 GW of onshore wind, although at times as much as three times the demand would be provided. 0.1% of the time would require generation from other sources. In March 2012, Denmark's parliament agreed on a comprehensive new set promotional programs for energy efficiency and renewable energy that will lead to the country getting 100 percent of electricity, heat and fuels from renewables by 2050. IRENEC is an annual conference on 100% renewable energy started in 2011 by Eurosolar Turkey. The 2013 conference was in Istanbul. More recently, Jacobson and his colleagues have developed detailed proposals for switching to 100% renewable energy produced by wind, water and sunlight, for New York, California and Washington states, by 2050. As of 2014[update], a more expansive new plan for the 50 states has been drawn up, which includes an online interactive map showing the renewable resource potential of each of the 50 states. The 50-state plan is part of The Solutions Project, an independent outreach effort led by Jacobson, actor Mark Ruffalo, and film director Josh Fox. As of 2014[update], many detailed assessments show that the energy service needs of a world enjoying radically higher levels of wellbeing, can be economically met entirely through the diverse currently available technological and organisational innovations around wind, solar, biomass, biofuel, hydro, ocean and geothermal energy. Debate over detailed plans remain, but transformations in global energy services based entirely around renewable energy are in principle technically practicable, economically feasible, socially viable, and so realisable. This prospect underpins the ambitious commitment by Germany, one of the world's most successful industrial economies, to undertake a major energy transition, Energiewende. In 2015 a study was published in Energy and Environmental Science that describes a pathway to 100% renewable energy in the United States by 2050 without using biomass. Implementation of this roadmap is regarded as both environmentally and economically feasible and reasonable, as by 2050 it would save about $600 Billion Dollars health costs a year due to reduced air pollution and $3.3 Trillion global warming costs. This would translate in yearly cost savings per head of around $8300 compared to a business as usual pathway. According to that study, barriers that could hamper implementation are neither technical nor economic but social and political, as most people didn't know that benefits from such a transformation far exceeded the costs. In June 2017, twenty-one researchers published an article in the Proceedings of the National Academy of Sciences of the United States of America rejecting Jacobson's earlier PNAS article, accusing him of modeling errors and of using invalid modeling tools. They further asserted he made implausible assumptions through his reliance upon increasing national energy storage from 43 minutes to 7 weeks, increasing hydrogen production by 100,000%, and increasing hydropower by the equivalent of 600 Hoover Dams. Article authors David G. Victor called Jacobson's work "dangerous" and Ken Caldeira emphasized that increasing hydropower output by 1,300 gigawatts, a 25% increase, is the equivalent flow of 100 Mississippi Rivers. Jacobson published a response in the same issue of the PNAS and also authored a blog post where he asserted the researchers were advocates of the fossil fuel industry. Another study published in 2017 confirmed the earlier results for a 100% renewable power system for North America, without changes in hydropower assumptions, but with more realistic emphasis on a balanced storage portfolio, in particular seasonal storage, and for competitive economics. In 2015, Jacobson and Delucchi, together with Mary Cameron and Bethany Frew, examined with computer simulation (LOADMATCH), in more detail how a wind-water-solar (WWS) system can track the energy demand from minute to minute. This turned out to be possible in the United States for 5 years. In 2017, the plan was further developed for 139 countries by a team of 27 researchers and in 2018, Jacobson and Delucchi with Mary Cameron and Brian Mathiesen published the LOADMATCH results for 20 regions in which the 139 countries in the world are divided. According to this research, a WWS system can follow the demand in all regions. a demand-supply management system (smart grid). The program has been carried out for each region 10-20 times with adapted input for the storage capacities, until a solution was found in which the energy demand was followed, per half minute for 5 years, with low costs. storage facilities: pumped hydro, as heat in CSP plants, in batteries, as hydrogen by electrolysis of water, or as compressed air underground. Some other places have high percentages, for example the electricity sector in Denmark, as of 2014[update], is 45% wind power, with plans in place to reach 85%. The electricity sector in Canada and the electricity sector in New Zealand have even higher percentages of renewables (mostly hydro), 65% and 75% respectively, and Austria is approaching 70%. As of 2015[update], the electricity sector in Germany sometimes meets almost 100% of the electricity demand with PV and wind power, and renewable electricity is over 25%. Albania has 94.8% of installed capacity as hydroelectric, 5.2% diesel generator; but Albania imports 39% of its electricity. In 2016, Portugal achieved 100% renewable electricity for four days between 7 May and 11 May, partly because efficient energy use had reduced electricity demand. France and Sweden have low carbon intensity, since they predominately use a mixture of nuclear power and hydroelectricity. Although electricity is currently a big fraction of primary energy; it is to be expected that with renewable energy deployment primary energy use will go down sharply as electricity use increases, as it is likely to be combined with some degree of further electrification. For example, electric cars achieve much better miles per gallon equivalent than fossil fuel cars, and another example is renewable heat such as in the case of Denmark which is proposing to move to greater use of heat pumps for heating buildings which provide multiple kilowatts of heat per kilowatt of electricity. Other electricity generating sources are considered clean, though not necessarily renewable, as they also do not emit carbon dioxide or other greenhouse gases. The largest of these is nuclear energy which produces no emissions. Carbon capture and storage projects may still use coal or natural gas but capture carbon dioxide for storage or alternative uses. Pathways to eliminate greenhouse gases may include these in addition to renewable energy so as to avoid shutting down existing plants and allow for flexibility in designing a carbon-free electric grid. In 2018 California passed SB 100, which will mandate 100% clean, carbon-free by 2045, including a 60% renewable energy goal by 2030. 2019 legislation in Washington will also require 100% clean energy by 2045, eliminating coal by 2025. NASA Climate scientist James Hansen discusses the problem with rapid phase out of fossil fuels and said that while it is conceivable in places such as New Zealand and Norway, "suggesting that renewables will let us phase rapidly off fossil fuels in the United States, China, India, or the world as a whole is almost the equivalent of believing in the Easter Bunny and Tooth Fairy." In 2013, Smil analyzed proposals to depend on wind and solar-generated electricity including the proposals of Jacobson and colleagues, and writing in an issue of Spectrum prepared by the Institute of Electrical and Electronics Engineers, he identified numerous points of concern, such as cost, intermittent power supply, growing NIMBYism, and a lack of infrastructure as negative factors and said that "History and a consideration of the technical requirements show that the problem is much greater than these advocates have supposed." Smil and Hansen are concerned about the variable output of solar and wind power, but American physicist Amory Lovins has said that the electricity grid can cope, just as it routinely backs up nonworking coal-fired and nuclear plants with working ones. In 1999 American academic Dr. Gregory Unruh published a dissertation identifying the systemic barriers to the adoption and diffusion of renewable energy technologies. This theoretical framework was called Carbon Lock-in and pointed to the creation of self-reinforcing feedbacks that arise through the co-evolution of large technological systems, like electricity and transportation networks, with the social and political institutions that support and benefit from system growth. Once established, these techno-institutional complexes become "locked-in" and resist efforts to transform them towards more environmentally sustainable systems based on renewable sources. Lester R. Brown founder and president of the Earth Policy Institute, a nonprofit research organization based in Washington, D.C., says a rapid transition to 100% renewable energy is both possible and necessary. Brown compares with the U.S. entry into World War II and the subsequent rapid mobilization and transformation of the US industry and economy. A quick transition to 100% renewable energy and saving of our civilization is proposed by Brown to follow an approach with similar urgency. In 2011, the Intergovernmental Panel on Climate Change, the world's leading climate researchers selected by the United Nations, said "as infrastructure and energy systems develop, in spite of the complexities, there are few, if any, fundamental technological limits to integrating a portfolio of renewable energy technologies to meet a majority share of total energy demand in locations where suitable renewable resources exist or can be supplied". IPCC scenarios "generally indicate that growth in renewable energy will be widespread around the world". The IPCC said that if governments were supportive, and the full complement of renewable energy technologies were deployed, renewable energy supply could account for almost 80% of the world's energy use within forty years. Rajendra Pachauri, chairman of the IPCC, said the necessary investment in renewables would cost only about 1% of global GDP annually. This approach could contain greenhouse gas levels to less than 450 parts per million, the safe level beyond which climate change becomes catastrophic and irreversible. Hydropower is currently the only large scale low-carbon seasonal energy storage. In countries with high variation in energy demand by season (for example the UK uses far more gas for heating in the winter than it uses electricity) but lacking hydropower electrical interconnectors to countries with lots of hydropower (e.g. UK - Norway) will probably be insufficient and development of a hydrogen economy will likely be needed: this is being trialled in the UK and 8 TWh of inter-seasonal hydrogen energy storage has been proposed. In Australia as well as storing renewable energy as hydrogen it is also proposed to be exported in the form of ammonia. ^ Ray Stern (2013-10-10). "Solana: 10 Facts You Didn't Know About the Concentrated Solar Power Plant Near Gila Bend". Phoenix New Times. ^ a b c Paul Gipe (4 April 2013). "100 Percent Renewable Vision Building". Renewable Energy World. ^ a b Armaroli, Nicola; Balzani, Vincenzo (2016). "Solar Electricity and Solar Fuels: Status and Perspectives in the Context of the Energy Transition". Chemistry – A European Journal. 22 (1): 32–57. doi:10.1002/chem.201503580. PMID 26584653. ^ a b Hansen, Kenneth; et al. (2019). "Status and perspectives on 100% renewable energy systems". Energy. 175: 471–480. doi:10.1016/j.energy.2019.03.092. ^ Pacala, S; Socolow, R (2004). "Stabilization Wedges: Solving the Climate Problem for the Next 50 Years with Current Technologies". Science. 305 (5686): 968–72. Bibcode:2004Sci...305..968P. CiteSeerX 10.1.1.642.8472. doi:10.1126/science.1100103. PMID 15310891. ^ a b Delucchi, Mark A; Jacobson, Mark Z (2011). "Providing all global energy with wind, water, and solar power, Part II: Reliability, system and transmission costs, and policies". Energy Policy. 39 (3): 1170–90. doi:10.1016/j.enpol.2010.11.045. ^ Armaroli, Nicola; Balzani, Vincenzo (2011). "Towards an electricity-powered world". Energy and Environmental Science. 4 (9): 3193–3222 . doi:10.1039/c1ee01249e. ^ a b "Scientists Sharply Rebut Influential Renewable-Energy Plan". ^ Frew, Bethany A.; Cameron, Mary A.; Delucchi, Mark A.; Jacobson, Mark Z. (2017-06-27). "The United States can keep the grid stable at low cost with 100% clean, renewable energy in all sectors despite inaccurate claims". Proceedings of the National Academy of Sciences. 114 (26): E5021–E5023. doi:10.1073/pnas.1708069114. ISSN 0027-8424. PMC 5495290. PMID 28630350. ^ National Research Council (2010). Electricity from Renewable Resources: Status, Prospects, and Impediments. National Academies of Science. p. 4. ISBN 9780309137089. ^ a b John Wiseman; et al. (April 2013). "Post Carbon Pathways" (PDF). University of Melbourne. ^ Sørensen, Bent (25 July 1975). "A plan is outlined according to which solar and wind energy would supply Denmark's needs by the year 2050". Science. 189 (4199): 255–260. Bibcode:1975Sci...189..255S. doi:10.1126/science.189.4199.255. ISSN 0036-8075. PMID 17813696. ^ a b c Hohmeyer, Olav H; Bohm, Sönke (2015). "Trends toward 100% renewable electricity supply in Germany and Europe: A paradigm shift in energy policies". Wiley Interdisciplinary Reviews: Energy and Environment. 4: 74–97. doi:10.1002/wene.128. ^ Green, Joshua (July–August 2009). "The Elusive Green Economy". The Atlantic. ^ a b Mark Diesendorf (4 April 2013). "Another Myth Busted on the Road to 100% Renewable Electricity". Reneweconomy.com.au. ^ "Elproduktion". www.energinet.dk. Archived from the original on 2016-03-02. Retrieved 2016-02-21. ^ Dennis Jacobe (April 9, 2013). "Americans Want More Emphasis on Solar, Wind, Natural Gas". Renewable Energy World. ^ Elliston, Ben; MacGill, Iain; Diesendorf, Mark (2013). "Least cost 100% renewable electricity scenarios in the Australian National Electricity Market". Energy Policy. 59: 270–82. doi:10.1016/j.enpol.2013.03.038. ^ "Implementation of Green Bookkeeping at Reykjavik Energy" (PDF). Rio02.com. Archived from the original (PDF) on 2012-06-17. Retrieved 2012-11-01. ^ "Energy Rich Japan". Energyrichjapan.info. Retrieved 2012-11-01. ^ "Zero Carbon Australia Stationary Energy Plan" (PDF). Archived from the original (PDF) on 2012-05-23. Retrieved 2012-11-01. ^ US EIA, International energy statistics data for 2011. ^ US EIA, Norway, updated 2014. ^ "A Roadmap for U.S. Energy Policy". Ieer.org. 2012-03-13. Retrieved 2012-11-01. ^ "A Road Map for U.S. Energy Policy" (PDF). Archived from the original (PDF) on 2012-09-13. Retrieved 2012-11-01. ^ Carrasco, Alicia (2012-04-09). "Denmark commits to 100% renewable energy". Emeter.com. Archived from the original on 2012-06-13. Retrieved 2012-11-01. ^ "Vision 2050". Inforse.org. 2010-12-02. Retrieved 2012-11-01. ^ "EU Sustainable Energy Vision 2040". Inforse.org. 2010-12-02. Retrieved 2012-11-01. ^ "Zero Carbon World". Zerocarbonbritain.org. 2011-11-09. Archived from the original on 2012-10-17. Retrieved 2012-11-01. ^ "HECO asserts Hawaii's renewable energy requirement can exceed 100%". ^ Roger, Simon (2018-03-21). "Un plan climat met Paris sur la voie de la neutralité carbone". Le Monde.fr. ^ "L'Eurométropole de Strasbourg dévoile son plan climat 2030". 2017-11-06. ^ "Has the World Already Passed "Peak Oil"?". News.nationalgeographic.com. 2010-11-09. Retrieved 2012-11-01. ^ "(PDF) Global Energy System based on 100% Renewable Energy - Power Sector". ResearchGate. Retrieved 2019-02-19. ^ University, Stanford (2018-02-08). "Avoiding blackouts with 100% renewable energy". Stanford News. Retrieved 2019-02-19. ^ Jacobson, Mark Z.; Delucchi, Mark A. (2011). "Providing all global energy with wind, water, and solar power, Part I: Technologies, energy resources, quantities and areas of infrastructure, and materials". Energy Policy. 39 (3): 1154–1169. doi:10.1016/j.enpol.2010.11.040. ^ Delucchi, Mark A.; Jacobson, Mark Z. (2011). "Providing all global energy with wind, water, and solar power, Part II: Reliability, system and transmission costs, and policies". Energy Policy. 39 (3): 1170–1190. doi:10.1016/j.enpol.2010.11.045. ^ Adam Aston (March 16, 2012). "Amory Lovins on 'Reinventing Fire' with convergence and innovation". Greenbiz. ^ Matthew Wald (October 27, 2011). "Fossil Fuels as the Whale Oil of the Future". New York Times. ^ John Elkington (21 March 2012). "Nine barriers to reinventing capitalism". The Guardian. ^ a b IPCC (2011). "Special Report on Renewable Energy Sources and Climate Change Mitigation" (PDF). Cambridge University Press, Cambridge, United Kingdom and New York, NY, USA. p. 17. ^ a b "Solar Energy Perspectives: Executive Summary" (PDF). ^ a b Mark Z. Jacobson & Mark A. Delucchi (2011). "Providing all global energy with wind, water, and solar power, Part I: Technologies, energy resources, quantities and areas of infrastructure, and materials" (PDF). Energy Policy. 39 (3): 1154–1169. doi:10.1016/j.enpol.2010.11.040. ^ Kate Galbraith. 100 Percent Renewables by 2030? Green Inc., December 1, 2009. ^ Jacobson, Mark Z.; Delucchi, M.A. (November 2009). "A Path to Sustainable Energy by 2030" (PDF). Scientific American. 301 (5): 58–65. Bibcode:2009SciAm.301e..58J. doi:10.1038/scientificamerican1109-58. PMID 19873905. ^ "Wind, solar power paired with storage could be cost-effective way to power grid". UDaily. ^ Stephen Lacey (29 March 2012). "A True 'All of the Above' Energy Policy: Denmark Affirms Commitment to 100% Renewable Energy by 2050". Renewable Energy World. ^ "International 100% Renewable Energy Conference". Irenec2012.com. 2012-06-26. Archived from the original on 2012-10-22. Retrieved 2012-11-01. ^ "IRENEC 2013". IRENEC 2013. Retrieved 2012-11-01. ^ Jacobson, Mark Z.; et al. (2013). "Examining the feasibility of converting New York State's all-purpose energy infrastructure to one using wind, water, and sunlight". Energy Policy. 57: 585–601. doi:10.1016/j.enpol.2013.02.036. ^ Jacobson, Mark Z.; et al. (2014). "A roadmap for repowering California for all purposes with wind, water, and sunlight". Energy. 73: 875–889. doi:10.1016/j.energy.2014.06.099. ^ Jacobson, Mark Z.; et al. (2016). "A 100% wind, water, sunlight (WWS) all-sector energy plan for Washington State". Renewable Energy. 86: 75–88. doi:10.1016/j.renene.2015.08.003. ^ Mark Schwarz (February 26, 2014). "Stanford scientist unveils 50-state plan to transform U.S. to renewable energy". Stanford Report. ^ Stirling, Andy (2014). "Transforming power". Energy Research and Social Science. 1: 83–95. doi:10.1016/j.erss.2014.02.001. ^ Jacobson, Mark Z; Delucchi, Mark A; Bazouin, Guillaume; Bauer, Zack A. F; Heavey, Christa C; Fisher, Emma; Morris, Sean B; Piekutowski, Diniana J. Y; Vencill, Taylor A; Yeskoo, Tim W (2015). "100% clean and renewable wind, water, and sunlight (WWS) all-sector energy roadmaps for the 50 United States". Energy & Environmental Science. 8 (7): 2093–117. doi:10.1039/C5EE01283J. ^ a b c d Porter, Eduardo (21 June 2017). "Fisticuffs Over the Route to a Clean-Energy Future". The New York Times. p. B1. Retrieved 4 August 2017. ^ Clack, Christopher T. M; Qvist, Staffan A; Apt, Jay; Bazilian, Morgan; Brandt, Adam R; Caldeira, Ken; Davis, Steven J; Diakov, Victor; Handschy, Mark A; Hines, Paul D. H; Jaramillo, Paulina; Kammen, Daniel M; Long, Jane C. S; Morgan, M. Granger; Reed, Adam; Sivaram, Varun; Sweeney, James; Tynan, George R; Victor, David G; Weyant, John P; Whitacre, Jay F (2017). "Evaluation of a proposal for reliable low-cost grid power with 100% wind, water, and solar". Proceedings of the National Academy of Sciences. 114 (26): 6722–6727. Bibcode:2017PNAS..114.6722C. doi:10.1073/pnas.1610381114. PMC 5495221. PMID 28630353. ^ Jacobson, Mark Z; Delucchi, Mark A; Cameron, Mary A; Frew, Bethany A (2017). "The United States can keep the grid stable at low cost with 100% clean, renewable energy in all sectors despite inaccurate claims". Proceedings of the National Academy of Sciences. 114 (26): E5021–E5023. Bibcode:2017PNAS..114E5021J. doi:10.1073/pnas.1708069114. PMC 5495290. PMID 28630350. ^ Jacobson, Mark (19 June 2017). "4 Reasons Nuclear and Fossil Fuel Supporters Criticizing 100% Renewable Energy Plan Are Wrong". EcoWatch. Retrieved 4 August 2017. ^ Aghahosseini, Arman; Bogdanov, Dmitrii; Breyer, Christian (2017). "A Techno-Economic Study of an Entirely Renewable Energy-Based Power Supply for North America for 2030 Conditions". Energies. 10 (8): 1171. doi:10.3390/en10081171. ^ Jacobson, M.Z., M.A. Delucchi, M.A. Cameron, and B.A. Frew, A low-cost solution to the grid reliability problem with 100% penetration of intermittent wind, water, and solar for all purposes, Proc. Nat. Acad. Sci., 112 (49) 15060-15065 December 8, 2015. ^ Jacobson, Mark Z; Delucchi, Mark A; Bauer, Zack A.F; Goodman, Savannah C; Chapman, William E; Cameron, Mary A; Bozonnat, Cedric; Chobadi, Liat; Clonts, Hailey A; Enevoldsen, Peter; Erwin, Jenny R; Fobi, Simone N; Goldstrom, Owen K; Hennessy, Eleanor M; Liu, Jingyi; Lo, Jonathan; Meyer, Clayton B; Morris, Sean B; Moy, Kevin R; O'Neill, Patrick L; Petkov, Ivalin; Redfern, Stephanie; Schucker, Robin; Sontag, Michael A; Wang, Jingfan; Weiner, Eric; Yachanin, Alexander S (2017). "100% Clean and Renewable Wind, Water, and Sunlight All-Sector Energy Roadmaps for 139 Countries of the World". Joule. 1: 108–21. doi:10.1016/j.joule.2017.07.005. ^ Jacobson, Mark Z; Delucchi, Mark A; Cameron, Mary A; Mathiesen, Brian V (2018). "Matching demand with supply at low cost in 139 countries among 20 world regions with 100% intermittent wind, water, and sunlight (WWS) for all purposes". Renewable Energy. 123: 236–48. doi:10.1016/j.renene.2018.02.009. ^ a b "Aspen is third U.S. city to reach 100% renewable energy". The Aspen Times. ^ a b c d e f "Washington State Electric Utility Fuel Mix Disclosure Reports For Calendar Year 2016" (PDF). Washington State Department of Commerce. October 2017. Retrieved February 4, 2019. ^ "Costa Rica Is 99% Powered By Renewable Energy - MetaEfficient". MetaEfficient. 2008-04-08. Retrieved 2015-11-23. ^ "Georgetown's energy 100 percent renewable with solar plant". ^ a b International Energy Agency, December 2014 Archived 2018-07-31 at the Wayback Machine, Monthly electricity statistics, data for January through December 2014. ^ Kodiak Electric Association, Statistics, accessed 21 July 2015. ^ "Lower Austria Claims 100% Renewable Electricity - CleanTechnica". cleantechnica.com. 2015-11-11. ^ Craig Morris (2014-06-24). "German state already has 120 percent renewable power". Renewables International. Archived from the original on 2015-09-24. Retrieved 2015-08-21. ^ Christoph Steitz (2014-09-04). "German state able to meet power demand through renewables". Reuters. Retrieved 2015-08-21. ^ "Palo Alto switches to 100% renewables – at a cost of $3 a year". 23 July 2013. ^ "'IRENA (2015), Renewable Energy Policy Brief: Paraguay; IRENA, Abu Dhabi'" (PDF). ^ "Denmark's Wind of Change". Time.com. Retrieved 2013-11-14. ^ Kolbert, Elizabeth. "The Island in the Wind". Newyorker.com. Retrieved 2013-11-14. ^ Craig Morris (2014-06-17). "Schleswig-Holstein: German state to go 100% renewable power... this year". Renewables International. Archived from the original on 2015-08-11. Retrieved 2015-08-20. ^ Christina MacPherson (2014-06-24). "In just 8 years, German State goes from 30% to 100% renewable energy". Nuclear-News. Retrieved 2015-08-20. ^ "Seattle City Light | Power Mix". www.seattle.gov. Retrieved 2018-07-31. ^ "Energy in New Zealand 2015". Ministry of Business, Innovation and Employment. Archived from the original on 2016-02-15. Retrieved 23 February 2016. ^ "Tajikistan | International Hydropower Association". www.hydropower.org. Retrieved 2018-11-16. ^ "Tesla runs an entire island on solar power". ^ "A small Greek island will become the first in the Mediterranean to run solely on wind and solar power after its businesses have been hindered by blackouts". ^ Watts, Jonathan (3 December 2015). "Uruguay makes dramatic shift to nearly 95% electricity from clean energy". The Guardian. ^ "Germany's renewable energy experiment comes at a cost". Financial Times. ^ Werber, Cassie. "Austria's largest state now gets 100% of its electricity from renewables". ^ , PV Magazine, Monthly electricity statistics, 26 August 2015. ^ "Electricity – Renewable Energies in the first half of 2012" (PDF). Archived from the original (PDF) on 2012-10-10. Retrieved 2015-09-01. ^ Albania, CIA World Factbook. ^ "Electricity production, consumption and market overview". ^ Embrace the change, Editorial, Nature Energy, 07 June 2016. ^ Jacobson, Mark Z.; et al. (2015). "100% clean and renewable wind, water, and sunlight (WWS) all-sector energy roadmaps for the 50 United States". Energy and Environmental Science. 8 (7): 2093–2117. doi:10.1039/c5ee01283j. ^ Vad Mathiesen, Brian; et al. (2015). "Smart Energy Systems for coherent 100% renewable energy and transport solutions. In". Applied Energy. 145: 139–154. doi:10.1016/j.apenergy.2015.01.075. ^ Spector, Julian (2018-08-29). "California Assembly Passes Historic 100% Carbon-Free Electricity Bill". www.greentechmedia.com. Retrieved 2019-02-04. ^ Roberts, David (2018-08-31). "California just adopted its boldest energy target yet: 100% clean electricity". Vox. Retrieved 2019-02-04. ^ "Inslee wants 100 percent clean energy in Washington by 2045". KING. Retrieved 2019-02-04. ^ a b "Nuclear energy and climate change: Environmentalists debate how to stop global warming". Slate Magazine. 2013-01-14. ^ Hansen, James (2011). "Baby Lauren and the Kool-Aid" (PDF). Retrieved 28 March 2013. ^ Vaclav Smil (2012-06-28). "A Skeptic Looks at Alternative Energy". ieee.org. ^ Amory Lovins (March–April 2012). "A Farewell to Fossil Fuels". Foreign Affairs (March/April 2012). ^ "Microsoft Word - Lock-in_Foxon_final.doc" (PDF). Retrieved 2018-07-25. ^ Lester R. Brown (2009). "Plan B 4.0, Mobilizing to Save Civilization" (PDF). Earth Policy Institute. ^ a b "Contribution of Renewables to Energy Security" (PDF). ^ Amory Lovins (2011). Reinventing Fire, Chelsea Green Publishing, p. 199. ^ IPCC (2011). "Special Report on Renewable Energy Sources and Climate Change Mitigation" (PDF). Cambridge University Press, Cambridge, United Kingdom and New York, NY, USA. p. 22. ^ a b Fiona Harvey (9 May 2011). "Renewable energy can power the world, says landmark IPCC study". The Guardian. London. ^ "IPCC – Intergovernmental Panel on Climate Change". ipcc.ch. ^ "What It Would Really Take to Reverse Climate Change". 2014-11-18. ^ "Engineers publish £22bn blueprint for UK to take global lead on hydrogen heating". The Chemical Engineer. 27 November 2018. ^ "What would Australia look like powered by 100% renewable energy?". The Guardian. Retrieved 28 January 2019. Albert, Barbara (2017). "Energy Unlimited: Four Steps to 100% Renewable Energy". Bogdanov, Dmitrii; Breyer, Christian (2016). "North-East Asian Super Grid for 100% renewable energy supply: Optimal mix of energy technologies for electricity, gas and heat supply options". Energy Conversion and Management. 110: 176–190. doi:10.1016/j.enconman.2016.01.019. Breyer, Christian; et al. (2015). "North-East Asian Super Grid: Renewable energy mix and economics". Japanese Journal of Applied Physics. 54 (8S1): 08KJ01. Bibcode:2015JaJAP..54hKJ01B. doi:10.7567/JJAP.54.08KJ01. Connolly, David; et al. (2016). "Smart Energy Europe :The technical and economic impact of one potential 100% renewable energy scenario for the European Union". Renewable and Sustainable Energy Reviews. 60: 1634–1653. doi:10.1016/j.rser.2016.02.025. Connolly, David; et al. (2011). "The first step towards a 100% renewable energy-system for Ireland". Applied Energy. 88 (2): 502–507. doi:10.1016/j.apenergy.2010.03.006. Cosic, Boris; et al. (2012). "A 100% renewable energy system in the year 2050: The case of Macedonia" (PDF). Energy. 48 (1): 80–87. doi:10.1016/j.energy.2012.06.078. Delucchi, Mark A.; Jacobson, Mark Z. (2011). "Providing all global energy with wind, water, and solar power, Part II: Reliability, system and transmission costs, and policies". Energy Policy. 39 (3): 1170–1190. doi:10.1016/j.enpol.2010.11.045. Peter Droege, 100 Per Cent Renewable. Energy Autonomy in Action. Routledge 2009, ISBN 978-1-849-71471-6. Elliston, Ben; et al. (2012). "Simulations of scenarios with 100% renewable electricity in the Australian National Electricity Market". Energy Policy. 45: 606–613. doi:10.1016/j.enpol.2012.03.011. Elliston, Ben; et al. (2013). "Least cost 100% renewable electricity scenarios in the Australian National Electricity Market". Energy Policy. 59: 270–282. doi:10.1016/j.enpol.2013.03.038. Elliston, Ben; et al. (2014). "Comparing least cost scenarios for 100% renewable electricity with low emission fossil fuel scenarios in the Australian National Electricity Market". Renewable Energy. 66: 196–204. doi:10.1016/j.renene.2013.12.010. Garcia-Olivares, Antonio; et al. (2012). "A global renewable mix with proven technologies and common materials". Energy Policy. 41: 561–574. doi:10.1016/j.enpol.2011.11.018. hdl:10261/92979. Glasnovica, Zvonimir; Margeta, Jure (2011). "Vision of total renewable electricity scenario". Renewable and Sustainable Energy Reviews. 15 (4): 1873–1884. doi:10.1016/j.rser.2010.12.016. Hansen, Kenneth; et al. (2019). "Status and perspectives on 100% renewable energy systems". Energy. 175: 471–480. doi:10.1016/j.energy.2019.03.092. Hohmeyer, Olav; Bohm, Sönke (2015). "Trends toward 100% renewable electricity supply in Germany and Europe: a paradigm shift in energy policies. In". Wiley Interdisciplinary Reviews: Energy and Environment. 4: 74–97. doi:10.1002/wene.128. Jacobson, Mark Z.; Delucchi, Mark A. (2011). "Providing all global energy with wind, water, and solar power, Part I: Technologies, energy resources, quantities and areas of infrastructure, and materials". Energy Policy. 39 (3): 1154–1169. doi:10.1016/j.enpol.2010.11.040. Jacobson, Mark Z.; et al. (2015). "100% clean and renewable wind, water, and sunlight (WWS) all-sector energy roadmaps for the 50 United States. In". Energy and Environmental Science. 8 (7): 2093–2117. doi:10.1039/c5ee01283j. Jacobson, Mark Z.; et al. (2015). "Low-cost solution to the grid reliability problem with 100% penetration of intermittent wind, water, and solar for all purposes". Proceedings of the National Academy of Sciences. 112 (49): 15060–15065. Bibcode:2015PNAS..11215060J. doi:10.1073/pnas.1510028112. PMC 4679003. PMID 26598655. Krajacic, Goran; et al. (2011). "How to achieve a 100% RES electricity supply for Portugal?". Applied Energy. 88 (2): 508–517. doi:10.1016/j.apenergy.2010.09.006. Krajacic, Goran; et al. (2011). "Planning for a 100% independent energy system based on smart energy storage for integration of renewables and CO2 emissions reduction". Applied Thermal Engineering. 31 (13): 2073–2083. doi:10.1016/j.applthermaleng.2011.03.014. Lund, Henrik (2007). "Renewable energy strategies for sustainable development". Energy. 32 (6): 912–919. CiteSeerX 10.1.1.541.331. doi:10.1016/j.energy.2006.10.017. Lund, Henrik; Vad Mathiesen, Brian (2009). "Energy system analysis of 100% renewable energy systems - The case of Denmark in years 2030 and 2050". Energy. 34 (5): 524–531. doi:10.1016/j.energy.2008.04.003. Lund, H.; et al. (2010). "The role of district heating in future renewable energy systems". Energy. 35 (3): 1381–1390. doi:10.1016/j.energy.2009.11.023. George Mason, Ian; et al. (2010). "A 100% renewable electricity generation system for New Zealand utilising hydro, wind, geothermal and biomass resources". Energy Policy. 38 (8): 3973–3984. doi:10.1016/j.enpol.2010.03.022. George Mason, Ian; et al. (2013). "Security of supply, energy spillage control and peaking options within a 100% renewable electricity system for New Zealand.". Energy Policy. 60: 324–333. doi:10.1016/j.enpol.2013.05.032. Vad Mathiesen, Brian; et al. (2011). ": 100% Renewable energy systems, climate mitigation and economic growth". Applied Energy. 88 (2): 488–501. doi:10.1016/j.apenergy.2010.03.001. Vad Mathiesen, Brian; et al. (2015). "Smart Energy Systems for coherent 100% renewable energy and transport solutions". Applied Energy. 145: 139–154. doi:10.1016/j.apenergy.2015.01.075. Sovacool, Benjamin K.; Watts, Charmaine (2009). "Going Completely Renewable: Is It Possible (Let Alone Desirable)?". The Electricity Journal. 22 (4): 95–111. doi:10.1016/j.tej.2009.03.011. Go 100% renewable energy by Renewables 100 Policy Institute. Net Zero Foundation—Education and Leadership of the transition to Net Zero fossil fuel. This page was last edited on 17 April 2019, at 15:35 (UTC).